British PM David Cameron has ordered an investigation into an MP's claim that the Thatcher government "colluded" with India on the deadly raid on the Golden Temple in Amritsar in 1984. MP Tom Watson told the BBC recently declassified documents showed Britain had advised Delhi on planning the raid. The storming of the Golden Temple was aimed at flushing out Sikh separatists. 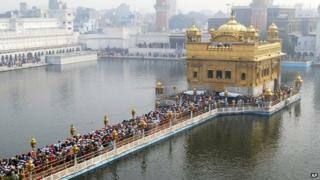 The controversial raid outraged Sikhs around the world, who accused troops of desecrating the faith's holiest shrine. The Indian government said about 400 people were killed in the raid - codenamed Operation Blue Star - including 87 soldiers. Sikh groups dispute this figure and say thousands died, including a large number of pilgrims who were visiting the temple. The Sikh separatists demanded an independent homeland - called Khalistan - in Punjab. Mr Watson, MP for West Bromwich East, said he had seen "top secret papers from Mrs Thatcher authorising Special Air Services (SAS) to work with the Indian government". It is not clear if the Indian government accepted any British advice - the general who led the operation, KS Brar, denied the UK had helped at all. "I have never heard of it before. As far as we are concerned, as far as the Indian army are concerned, there was no mention of this ever," he told the BBC Asian network. On Tuesday, the UK government said the cabinet secretary's investigation would try to establish the facts "as quickly as possible" but that he would also look at whether the papers should have been released or not. A spokesperson for Mr Cameron had earlier said these events "led to a tragic loss of life and we understand the very legitimate concerns that these papers will raise". The statement added that the prime minister and foreign secretary "were unaware of these papers prior to publication". Mr Watson has cited two letters which have only just been released under the 30-year rule and published on the blog Stop Deportations. One, dated 6 February 1984 from the prime minister's office, talks about the "Indian request for advice on plans for the removal of dissident Sikhs from the Golden Temple". It states that the prime minister is "content that the foreign secretary should proceed as he proposes". The other letter, dated 23 February 1984, said "the foreign secretary decided to respond favourably to the Indian request and, with the prime minister's agreement, an SAD officer has visited India and drawn up a plan which has been approved by Mrs Gandhi. The foreign secretary believes that the Indian government may put the plan into operation shortly". It appears that the writer committed a typographical error in mentioning SAS as SAD in the letter. The attack on the temple took place in June 1984. Mr Watson said the government appears to have "held back" some documents and must disclose more information. "I think British Sikhs and all those concerned about human rights will want to know exactly the extent of Britain's collusion with this period and this episode and will expect some answers from the Foreign Secretary," Mr Watson told BBC Asian Network. "But trying to hide what we did, not coming clean, I think would be a very grave error and I very much hope that the Foreign Secretary will... reveal the documents that exist and give an explanation to the House of Commons and to the country about the role of Britain at that very difficult time for Sikhism and Sikhs," Mr Watson added. Operation Blue Star led to the assassination of Prime Minister Indira Gandhi, who was killed by her Sikh bodyguards in revenge.